Coronectomy was first described by Ecuyer and Debien in 1984 as an alternative procedure to traditional extraction of third molars. 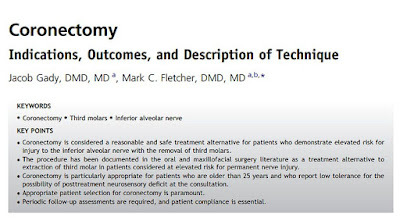 Several reports have been published since regarding the technique, indications, efficacy, and outcome of this procedure. 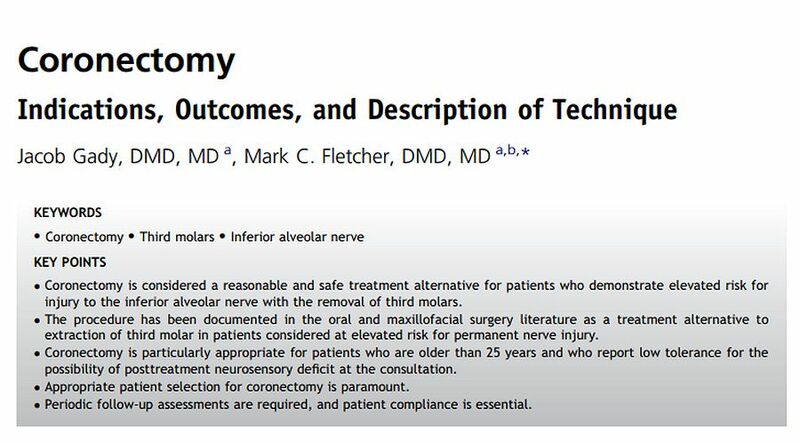 Most recently, it has been investigated as an alternative to traditional surgical extraction of third molars, particularly for those with an increased risk of damage to the inferior alveolar nerve (IAN). Several studies have demonstrated that coronectomy does significantly decrease the risk of iatrogenic injury to the IAN, with some studies also suggesting a lower complication rate. This article discusses the indications for coronectomy, the author’s technique, and the complications and outcomes of this procedure.